We supply a superb range of very strong rotationally moulded tanks, with baffles already moulded in place during manufacture. These tanks range in size from 400 litres to 650 litres capacity. 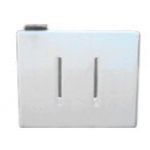 They are designed to be mounted horizontally or vertically. Baffles are internal compartments within a tank, restricting movement of the liquid load in a part full tank during transit. This movement of a liquid load can have a dramatic and dangerous effect on the road holding of the vehicle. Flat 1000 litre translucent baffled polythene water tank The overall dimensions are 1590mm Long x 1240mm Wide x 590mm High. It weighs 60.0 Kg and has moulded internal baffles. Ideal for van mounting, to transport liquids It is made from natural translucent medium density polyethylene with a 1" BSP outlet and 8" cap. Options to order include 6" spring vented cap and 8" vented black cap. Flat 400 litre translucent baffled polythene water tank The overall dimensions are 1250mm Long x 1010mm Wide x 360mm High. It weighs 30.0 Kg and has moulded internal baffles. Ideal for van mounting, to transport liquids It is made from natural translucent medium density polyethylene with a 1" BSP outlet and 8" cap. Options to order include 6" spring vented cap and 8" vented black cap. 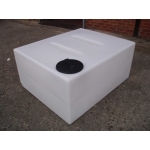 Flat 650 litre translucent baffled polyethylene water tank The overall dimensions are 1250mm Long x 1010mm Wide x 575mm High. It weighs 42.0 Kg and has moulded internal baffles. Ideal for van mounting, to transport liquids It is made from natural translucent medium density polyethylene with a 1" BSP outlet and 8" cap. Options to order include 6" spring vented cap and 8" vented black cap. Upright 250 litre translucent baffled polyethylene water tank The overall dimensions are 1100mm Long x 825mm High x 325mm Wide. It weighs 19.0 Kg and has moulded internal baffles. Ideal for van mounting, to transport liquids It is made from natural translucent medium density polyethylene with a 3/4" BSP outlet and 8" vented cap. Options to order include 1" outlet, 4" red cap, 6" spring vented cap and 8" black cap. Upright 400 litre translucent baffled polythene water tank The overall dimensions are 1250mm Long x 360mm Wide x 1010mm High. It weighs 26.0 kg and has moulded internal baffles. Ideal for van mounting, to transport liquids. It is made from natural translucent medium density polyethylene with a 1" BSP outlet and 8" vented cap. Options to order include a 4" red cap, 6" spring vented cap and 8" black cap. Upright 500 litre translucent baffled polyethylene water tank The overall dimensions are 1000mm Long x 920mm High x 620mm Wide. It weighs 35.0 Kg and has moulded internal baffles. Ideal for van mounting, to transport liquids It is made from natural translucent medium density polyethylene with a 1" BSP outlet and 8" vented cap. Options to order include a 4" red cap, 6" spring vented cap and 8" black cap.